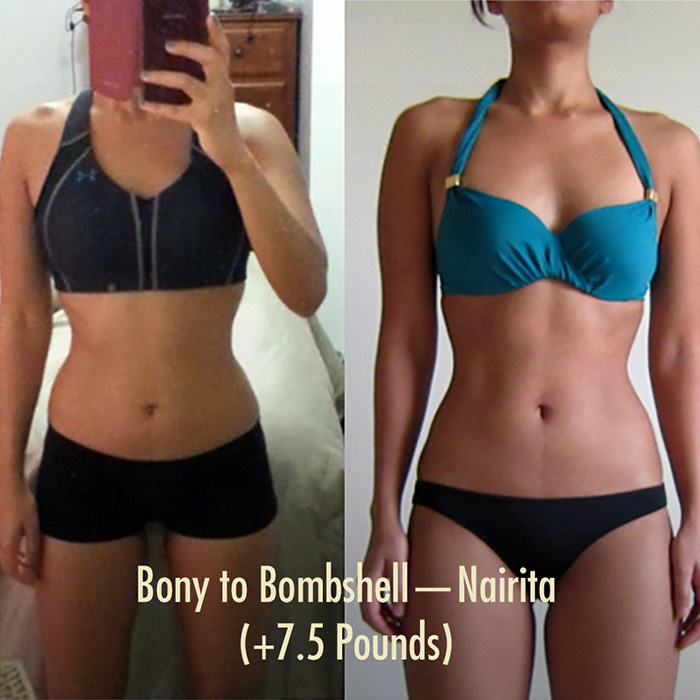 If you’re a naturally skinny woman with naturally narrower hips, you might be wondering: is it even possible to get bigger hips? What’s all this talk about the waist-to-hip ratio? What’s the most attractive ratio? How can I improve my ratio naturally? These are questions we get a lot. 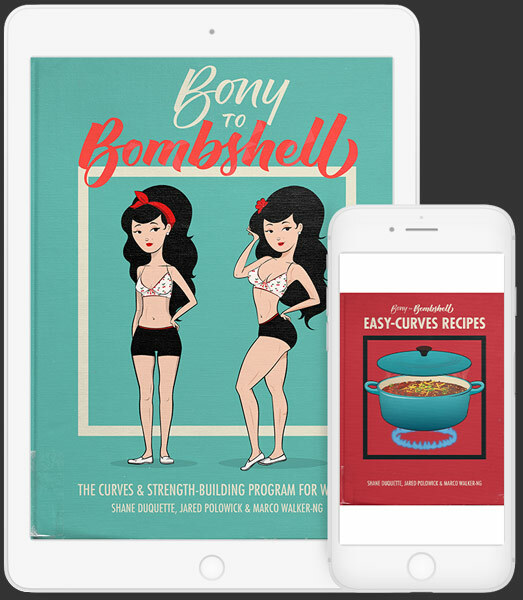 So inside this article, we’ll be talking about why so many women want to have wide hips with a small waist, what we can’t change, what we can change, and some action steps you can take today to quickly start adding inches to your hip measurement to immediately start improving your waist-to-hip ratio. Someone who is naturally thin. Women can be ectomorphs because of thinner bones, longer bones, a smaller stomach, a more fat-resistant metabolism, or any number of other factors. Someone who resists weight gain even while in a calorie surplus. Hardgainers will often have an adaptive metabolism, where they subconsciously burn off extra calories by fidgetting, moving less efficiently, producing more body heat, or being more active. Burning off extra energy doesn’t tend to limit muscle growth, just fat storage. This a common postural issue, where an ectomorph has a forward tilting pelvis that causes her lower stomach to jut forward. There are many ways to correct this, including practicing good deadlift technique, getting better at planks, and doing our postural work. The beneficial growth caused by a lifestyle that involves good lifting, good nutrition, and good rest. This can be muscle, yes, but gains also include the production of more digestive enzymes, a stronger digestive system in general, a bigger stomach, stronger bones, stronger tendons, greater strength, and greater coordination. This is the steroid-like growth that new lifters get when they first begin correctly lifting and eating for muscle growth. The body weight that your body is trying to maintain or return to. If you are currently maintaining your weight at, for example, 100 pounds, then 100 pounds is likely your set point right now. If you were to follow your appetite, you would likely remain around 100 pounds. When you bulk up (or cut down) to a different weight, your body will gradually reset its set point over the course of a few months. During this period, it’s important to maintain your weight deliberately. After that, your appetite should keep you there naturally, just like it naturally kept you hovering around 100 pounds in the past. When your muscles are temporarily swollen with blood. It lasts 10–20 minutes, then slowly deflates. This is a term popularized by the nutrition researcher Alan Aragon, who grew frustrated by the fact that people were trusting the anecdotal stories of jacked dudes that blatantly contradict scientific research. 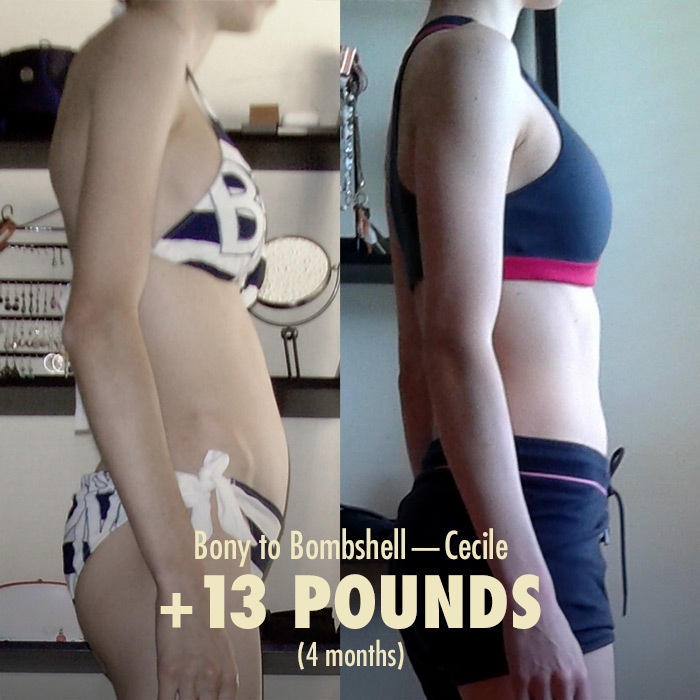 After all, sometimes people can get results in spite of what they’re doing, not because of it. 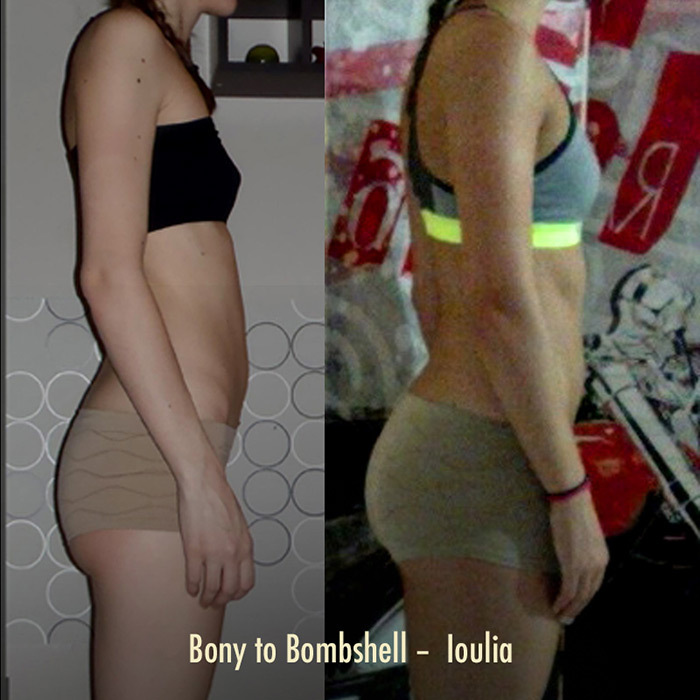 A Bombshell blend of lifting techniques taken from both powerlifting and bodybuilding. This is done to maximize both size and strength adaptations, which both work additively with one another. 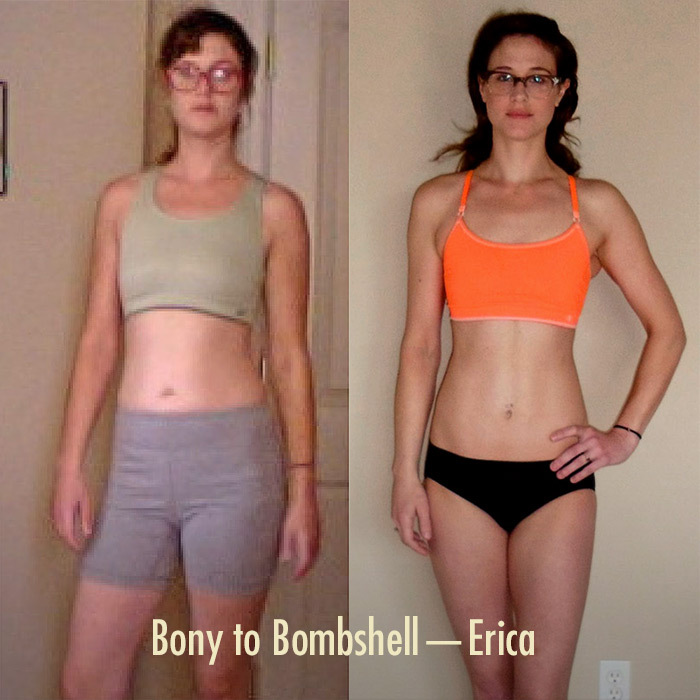 We also use some strongwoman and athletic conditioning techniques, but Bony to Bombshell could still be considered a powerbuilding program. Clean foods are not those that are well-washed, but rather those that are exalted. Which foods are exalted will depend on one’s nutrition ideology. To a clean vegan, grains are considered clean, but bacon is seen as dirty. To a clean paleodite, bacon is seen as clean, but grains are considered dirty. These are the foods that are nutritious, delicious and calorically dense. Common examples include dark chocolate, trail mix, smoothies, milk, cheese, lattes, bananas, whey protein, rice, and beans. Building muscle, usually while trying to limit fat gains. Trying to gain only muscle. Lean bulking can be done by very meticulously tracking macros to ensure a very consistent, very precise daily caloric surplus. This process is delicate and finicky, so it’s rare for a beginner to possess both the knowledge and meticulousness required to do it properly. Bulking up as quickly as possibly, often resulting in the bulker becoming fat. If you’re gaining more than a pound per week after your first month of lifting, there’s a good chance you’re dreamer bulking. Bulking up by eating foods that aren’t held in high regard—oftentimes junk food. Sometimes this will be a dreamer bulk… but sometimes not! The amount of fat you gain while dirty bulking will depend on how quickly you’re gaining weight, how well you’re sleeping, how active you are, how high your body fat percentage is, how good your genetics are, and more. Junk food is just one of many factors, so dirty bulks can sometimes be quite lean. Bulking up by eating only exalted foods. As with dirty bulking, this doesn’t always affect how lean your gains are, but rather how righteous your gains feel. Losing fat while avoiding muscle loss. Separate workout days for separate body parts. The most typical bro split is the triple split, where Monday is chest day, Wednesday is back day, and Friday is leg day. Some people look down on this style of training because 48 hours after stimulating a muscle, all growth stops. This means that on a bro split, your muscles would only be growing 29% of the time. 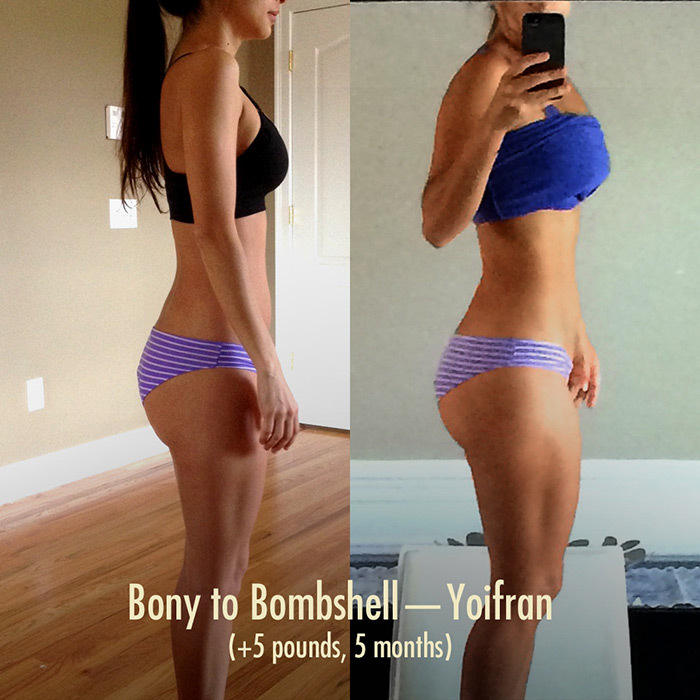 (With the Bombshell program your muscles will be growing 86% of the time.) Training your muscle groups more frequently is also better for improving coordination and athleticism. It’s worth noting that bro splits are not ineffective, though, just not optimal. This is where you stop your set a rep or two shy of failure, ensuring that your technique is always good, that you’ll be able to lift heavy again next set, and that you’ll recover in time for your next workout. When you ignore the “two reps in the tank” concept and try your darndest to push the weight up through a combination of effort, involuntary grunting, and facial strain. short for macronutrients, which bodybuilders will often keep track of. The four macronutrients are protein, carbs, fat and alcohol. Protein and carbs have 4 calories per gram, alcohol has 7, and fat has 9. These are the bulleted notes directly under the exercise name. First watch the video of Marco teaching the lift, then, when you’re working out, use these cues as reminders of what you should be focusing on. This is one full execution of the exercise movement—the lifting and lowering of the weight. 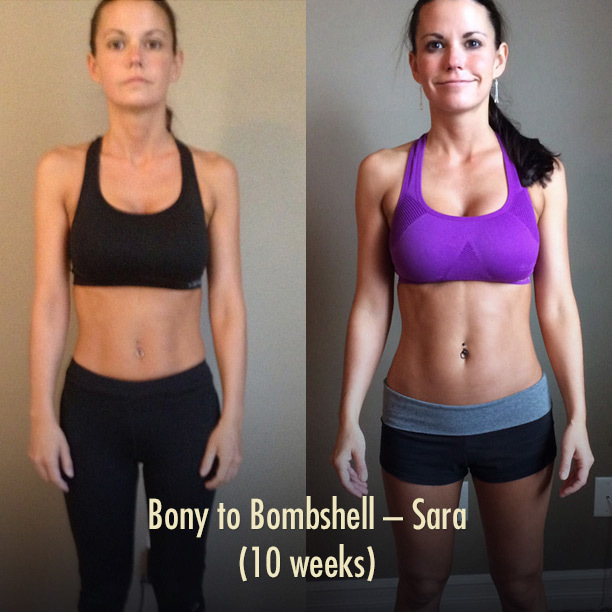 If you need to do 10 repetitions, you will need to lift and lower the weight 10 times. A set is a group of repetitions done without pause. You should always aim to be within 2 reps of what’s listed on the sheet. So if the sheet says 10 reps, it’s okay to do 8 reps with a heavier weight or 12 reps with a lighter weight. When you’re done the set, rest for the time listed. However, feel free to rest longer if you need to. When training for cardiovascular fitness it’s best to use short rest times to keep your heart rate up. When trying to gain muscle though, strength must be prioritized, and it takes rest in order to get your strength back. This is why the workout sheets have the plus sign (+) next to the rest times. The exercises in each circuit are complementary to each other, allowing each muscle group to get plenty of rest. This won’t have a big impact on how much muscle you’ll build, but they’ll give your cardiovascular system a greater stimulus and allow you to lift more in a shorter period of time. There are some secondary benefits to this as well, such as tiring antagonist muscles. It goes without saying that not every program is created equal. Some programs are way too restrictive in what you can eat and causes anxiety, some programs have you doing way too much, or are needlessly complex and cause hopelessness. Our first goal is that you get the optimal amount of work in to build the most amount of muscle. Our second goal is for you to be leaving the gym feeling better than before you worked out. How long and how often are the workouts? Each workout lasts under an hour and we recommend lifting weights 3x a week. In a few short weeks, you should be looking forward to the workouts, not running away from them! The way we’ve done this is by optimizing our workouts for building muscle as efficiently as possible according to time-tested research published in scientific journals, then we tested them on women for over a year, then we’ve continue to tweak the workouts over the past few years to improve them further. Yes! In fact, most of our members are working out from home. If you don’t have any equipment yet, we’ve included a how-to guide to help you choose the best equipment (most efficient, highest quality, cheapest price, etc.) that you can find in your dashboard after joining. You don’t need anything fancy, and it doesn’t need to take up a lot of space. All our program requires are 2 adjustable dumbbells and an adjustable bench. As you continue to grow and get stronger, later on, you could choose to add to your home gym if you’d like. Why is the price charged in USD currency? While our company is owned and operated in Canada, many of our members do not reside in Canada. They are accessing the website from all over the world. The USD currency is very stable globally and familiar, so we use that currency so we do not need to change our prices consistently. Our payment processors, Stripe & Paypal, will automatically convert your currency to USD. So you can check out from any country that’s accepted by those processors. You will only be charged tax if you are a Canadian resident, as our company is owned and operated out of Canada. If I’m Canadian, what tax rate will I be charged? The tax rate is dependent based on your location, so it will depend on which province you reside in. When you’ve decided to check out, the charge is submitted to your bank or credit card provider. They have automated systems that will determine if they should authorize or decline the payment. The systems look at things like your spending habits, your account balance, and if you make international purchases, etc. This can be solved quickly by calling the number on the back of your credit card and explaining that you’d like the charge to go through. Our word is something we hold dearly. And our commitment to you is to be clear and give you what you need to succeed. If you don’t like the program, it’s not a good fit for your fitness goals, it’s not what you thought it was going to be—it really doesn’t matter what the reason is. Just get in touch if you’d like a return and we’ll refund your money. If it doesn’t work out, it’s okay. Returns happen. We won’t even ask for an explanation. But we are listening if you have feedback for us. 30 days is how long you have to decide if you want to keep the program. If you’d like a refund all you need to do is email us. No need to call in and waste your time. It’s helpful if you can include the email address you used when buying the program so we can find the invoice quickly. Once we process the refund it’ll take 3–5 business days for the refund to be recognized by your credit card provider or bank. There’s nothing to send back, just delete the files downloaded your computer, tablet, or phone. We know it’s hard to trust someone you just met, especially when it’s related to the fitness industry. And we take your trust seriously. We want to do right by you, and are trying to do whatever we can to make the process as clear and upfront as possible. You can change your public username anytime. Your username is what will display in the community forum, and you can use your username to log in. Log into your account. After logging in you are automatically forwarded to your dashboard. Hover over My Account and click Settings. Update the text field What should we call you? and click the Save Profile button at the bottom of the page.